A publicly traded U.S. tobacco company has bought controlling stakes in two Canadian marijuana producers and invested in a North Carolina hemp grower, making what is believed to be the first foray by a significant tobacco business into the cannabis industry. Alliance One International, which trades on the New York Stock Exchange under the ticker symbol AOI, said it acquired a 75% equity position in Canada’s Island Garden and an 80% stake in Goldleaf Pharm. Terms of the transactions were not disclosed. The moves were first reported by New Cannabis Ventures. 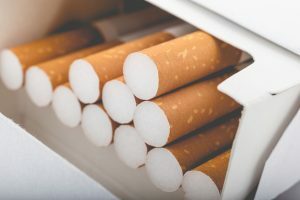 Alliance One is an independent leaf tobacco merchant based in Morrisville, North Carolina, that serves large multinational cigarette manufacturers. The company selects, purchases, processes, packs, stores and ships leaf tobacco. Alliance One’s purchase follows a similar move in October by global alcohol giant Constellation Brands, which bought 9.9% of Smiths Falls, Ontario-based Canopy Growth for 245 million Canadian dollars ($190 million). Both transactions mark the alcohol and tobacco industries’ initial attempts to capitalize on the rapidly growing marijuana industry – particularly in Canada, which is slated to legalize adult-use marijuana this summer. “This might be the key piece that (the industry) needs,” said Nic Easley, CEO of Denver-based 3C Consulting. “Constellation was the first (outside player), a major alcohol company. According to a news release, Alliance One purchased the two Canadian cultivators in January through a subsidiary, Canadian Cultivated Products. Island Garden is one of three licensed producers tapped to supply Prince Edward Island with cannabis. The company has a 20,000-square-foot indoor growing facility in Charlottetown, Prince Edward Island, and plans to expand its facility by 250,000 square feet of greenhouse capacity. Goldleaf Pharm is an applicant to become a licensed medical marijuana cultivator in Ontario, Canada. The company is completing construction of a 20,000-square-foot indoor growing facility with plans to add 710,000 square feet of production over a three-year period. Alliance One entered the hemp business in December, acquiring a 40% equity position in North Carolina-based Criticality, with an option for consolidation of up to 50% by 2020. Terms of the deal weren’t disclosed. Criticality grows industrial hemp in North Carolina under the state’s pilot program for CBD extraction. The hemp company plans to expand to other states in 2018, CEO Brian Moyer told Marijuana Business Daily. A North Carolina hemp farmer who is familiar with the deal, Bob Crumley, said the tobacco industry is almost certain to increase investments in the cannabis industry. “R.J. Reynolds and other big tobacco companies have always had, in the back of their minds, one day being in the cannabis business,” said Crumley, president of Founder’s Hemp. Founder’s Hemp contracts with former tobacco farmers to raise hemp, then processes it into CBD products in Asheboro, North Carolina. Tobacco farmers and outdoor cannabis growers can use the same cultivating equipment and drying facilities, and both crops are labor intensive, Crumley said. He argues that cannabis’ suitability in tobacco-growing areas explains why hemp was made legal in the 2014 Farm Bill. “It was politicians from tobacco states who said, ‘We need something to replace tobacco,’ who are responsible more than anyone for hemp being in the U.S. today,” Crumley said. In its news release, Alliance One said its five-year goal is to become a leader in CBD production and consumer products. For the first nine months of Alliance One’s fiscal year, sales increased 8.8% to $1.2 billion mainly driven by the larger South American crop and a 7.5% increase in average sales price due to a favorable product mix. Alliance One’s net earnings for that nine-month period were $56.9 million, or $6.34 per share. Hemp reporter Kristen Nichols contributed to this report. Jay, thanks for pointing out. We’ve done so. I like marijuana but we all know what happen to cigarettes when big tobacco got greedy and started adding fillers to their products.I say no to big tobacco they are not trust worthy period. Ron, your exactly right the tobacco and alcohol companies need to stay in their lane. I don’t see any of them out fighting for the legalization of marijuana or hemp. They just want to stick their nose in a industry that is making a lot of money so they can get richer. I so agree! Hope medical marijuana won’t roll over to big tobacco for their money. We don’t need tobacco greed or trickery or toxic sprays to the plants. PLEASE!!! We need healthy plants that give healthy options to people…not buy outs for money….then back to dangerous pills etc. for money sake. I have to agree. Big tobacco has, in the past, and still tries, to tell us that their products are safe. 7000 studies were needed, that WE paid for, to try to convince the ordinary public, that smoking was a BAD habit. I dread the twisting that will be done on TRUTH, when these kinds of deals are possible. !!!!!! Lets not get up in arms regarding this. All players know we need the big boys to play in order to progress. All will be tested in Canada by independent labs so that in itsel is a great start. Just buy some stock and relax. Absolute horse sh$t!!!!!!!! They kill millions of people and lied from there inception. In fact lying was integrated into the cooperate structure of every level of there business. They purposely made there product less safe, more deadly and hilariously addictive. Yeah America! way to screw small business before the industry even gets off the ground. Well I say know your products and find there origins and and additives if any. People will make there own choice but this is a dark dark day for the MMJ industry. Unfortunately a dark day that was bound to arrive. Get some Aphria, the lowest cost producer run by pharma pro’s. why Aphria, there are a lot of other options, do you have a inside scoop? Check out 420investor.com or marketfy.com. Subscribe, then live to it for true info on the industry. CBWTF .. Cannabis Wheaton. Check them out, IMO, a very interesting business model. I just bought some and my plan is to let sit for a few years .. Cheers! This may be acceptable for the recreational market. But please keep those poison death dealers away from my medicine. The industry has many rules to make this legal cannabis experiment as safe as possible. Why would anyone buy a product from a company that also sells products that can and do kill humans. With that being said, maybe it would be easier to compete with a brand that people WILL NOT BUY. I agree with Ron Youngblood tobacco is hardly an industry to get into cannabis production. Cannabis has never killed anyone from cancer or given any kind of disease to anyone. Cannabis flowers and CBD’s heal you and puts your nervous system into homeostasis. We all know what tobacco does, it is a killer substance. However hemp fibers and hurds can make over 25,000 products plus biodegradable plastics and methanol fuel that does not pollute. it is good to have tobacco’s money behind the hemp industry to help it grow into the economic powerhouse that it used to be before the oil, paper making and chemical companies lied to stop hemp production in 1937. BESIDES MEDICINE HEMP WILL BECOME AN INDUSTRIAL POWER HOUSE ALL BY ITSELF. Agreed. So much for caring about wellness. Not surprised about big tobacco’s foray into the sector as we know that all they care about is cash. The corporatization of cannabis is not always the friend of the consumer. That said there are many good people in the industry. I will support those who support wellness and boycott those who don’t care about us. My disappointment lies with those willing to sell out to the merchants of death. So sad, but there is honour amongst thieves so maybe it is time to support the clandestine market once again. I have 10000 shares of universal leaf co. Does anyone know where and they are going anywhere with maryjane?